Some performers don’t like to repeat themselves. One version of a song, one rendition of a character and they’re out—they’ve said their piece, they’re on to bigger and better things. Curiously enough, while Jim Henson was constantly moving on to bigger and better things, he wasn’t above the occasional reprise or revision. The Muppet Show is rife with such second takes, most often restaged versions of Muppet sketches originally performed on the 1960s variety-show circuit. The purpose for doing so is clear: On The Muppet Show, Henson controlled the way these scenes were presented. No “and now for the kiddies” introductions from Ed Sullivan, no “Jim Jenson” from Johnny Carson—just “Inchworm” or “Coffee Break Machine” or “Evening At The Pops” presented on Henson’s terms, to be viewed as pieces of legitimate, all-ages entertainment. Then again, there was no readily accessible way to watch the original versions of those sketches around the time The Muppet Show debuted, so those encore presentations are also for the benefit of viewers who didn’t see them the first time around. The same goes for pieces performed on The Muppet Show: With the way the series’ star rose between its first and second seasons, it’s surprising that more of the standout numbers from the first set of episodes don’t recur the way “Bein’ Green” does in Episode 219. However, “Bein’ Green” has a distinct advantage over those other classic Muppet sketches: Its message is so poignant and universal, it bears repeating. It illuminates different sides of the character who sings it, as well. As used in the Peter Ustinov episode of The Muppet Show, “Bein’ Green” is Kermit’s way of coping with being overshadowed by a guest star; in Episode 219, it’s deployed like a calming mantra amid the chaos brought about by Peter Sellers, Bunsen Honeydew’s latest invention, and a booking canceled by duck season. Jim Henson liked to set his amphibian alter ego adrift on The Muppet Show, but there’s always an object he can grab hold of to avoid drowning. In that way, Kermit performs “Bein’ Green” during every Muppet Show—he’s just doing so in his head for the other 118 episodes. 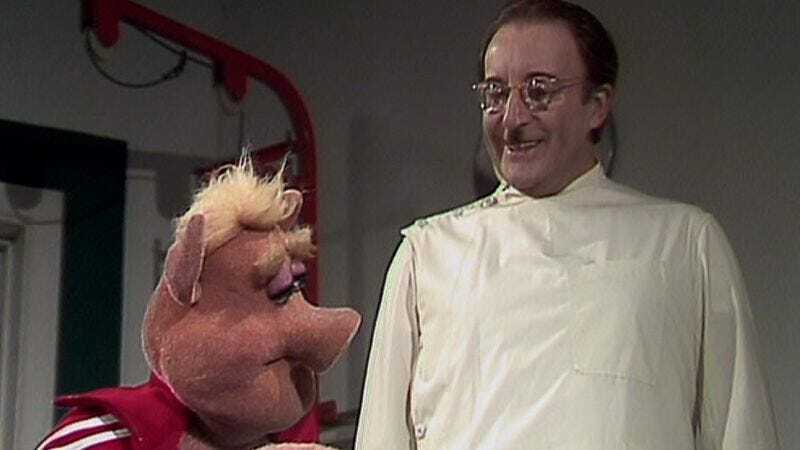 “With our special guest star”: Some performers don’t have enough personality for The Muppet Show; Peter Sellers is that rare guest who could populate the cast of a variety show all by himself. The multitude of characters within Sellers presents the ultimate paradox of his career: As he tells Kermit backstage, “I could never be myself. There is no me, I do not exist. There used to be a me, but I had it surgically removed.” That’s spooky, existential stuff for family hour, but it makes for a guest who’s as game, flexible, and eager to throw himself into character as his hosts. “The most sensational, inspirational, celebrational”: Of course, he’s not as physically flexible as Link Hogthrob, who’s made into a pork-stuffed pretzel by Sellers’ sadistic masseur in a sketch that’s a highlight of the episode and the series as a whole. Affecting the Teutonic accent of Dr. Strangelove (and the toothbrush mustache of Strangelove’s beloved Führer), Sellers gives Link a massage that’s more beatdown than rubdown, a technique derived from the Looney Tunes Guide To Relaxation. Jim Henson meets Sellers’ mania with a particular calm, all the better to underline the physical torture (and comedy) visited upon Link. “It’s like a kind of torture to have to watch the show”: I haven’t a single complaint about this episode. It’s not the out-and-out funniest half-hour of the second season, but every minute is perfectly inspired and entertaining. “It’s time to play the music”: The cohesiveness of the episode could be attributed to the thematic base for most of its musical numbers: “A Gypsy’s Violin,” “When,” and “Memory Lane” were all authored by Abe Burrows, a showbiz polymath who received his big break in radio before writing musicals like Guys And Dolls and How To Succeed In Business Without Really Trying. (An item of note that’s not on his résumé: He was the father of revered sitcom director James Burrows.) 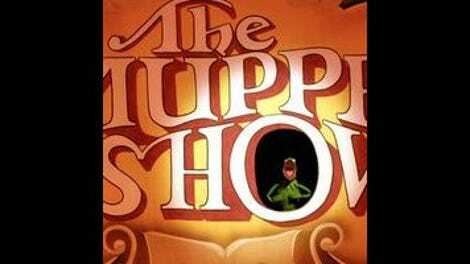 The humor of Burrows’ lyrics jibes with The Muppets penchant for wordplay and absurdity, and “A Gypsy’s Violin” even makes room for Statler-and-Waldorf-style color commentary from the background characters. “It’s time to raise the curtain”: Muppet Labs’ latest development isn’t as cutting edge as Bunsen Honeydew would like to think: His teleporter is powered by the “Jeannie Cut,” a special effect as old as filmmaking itself. The episode makes good use of the old trick, though, zapping Bunsen, Beaker, Sellers, Kermit, and Quongo the Wild Mountain Gorilla in and out of frame at such an unpredictable rate it’s a wonder Kermit even makes it to his “Bein’ Green” reprise. “It’s time to meet The Muppets”: If the periodically static chorus for “A Gypsy’s Violin” is any indication, that scene required the show to temporarily draft some second-string puppeteers into its ranks. (Either that, or whoever played Wanda didn’t realize how often the character was in the shot.) Contrast that to the liveliness of Henson’s performance in “Bein’ Green,” where Kermit is invested with so much personality and vim, all that’s required to complete the scene are a few pieces of basic scenery. The character and the song are so strong, closeups against a darkened background work just as well. “With our special guest star”: Petula Clark eschews the hits from her 1960s heyday on The Muppet Show, opting instead for some bossa nova, a Stevie Wonder deep cut, and a big Broadway number—which is good, because I don’t really feel like having “Downtown” stuck in my head for the rest of the week. But without her most well-known song (or “Don’t Sleep In The Subway” or “A Sign Of The Times”), Clark’s just a moderately talented, largely unremarkable guest, who at one point readily submits to being upstaged by backstage interloper Mickey Moose. “The most sensational, inspirational, celebrational”: But who wouldn’t want to join The Moosekateers, if only to join in on the infectious chorus of “The Mickey Moose Club March”? For an episode that consistently calls back to the gag-based style of the first season, Mickey provides a fun twist on simpler backstage runners like Fozzie’s recurring telephone jokes in Episode 105. The moose is more device than character (he’s mostly here to provide Kermit with the frog’s weekly irritant) but Jerry Nelson fleshes out Mickey to some degree by giving him the drawling voice of John Wayne—with matching easy-going, down-home demeanor. It’s a bold choice, one that pays off once Richard Hunt shows up as the urbane aquatic fowl Ronald Duck, an intrusion that, given The Walt Disney Company’s current ownership of the Muppet Show characters, is eerily prescient. “It’s like a kind of torture to have to watch the show”: Episode 220 features another Abe Burrows composition, “Sea Shanty,” though its execution leaves a lot to be desired. The Muppets’ charms are inherently lo-fi, so it’s always a crapshoot when they’re mixed in with advanced filmmaking techniques like chroma key effects; as such, shoddy chroma-key work decreases a segment’s chances of success significantly. For all the excellent work that’s going on above the surface of the water on “Sea Shanty,” the water itself is distractingly phony. At least the show managed to get this type of setup right by the time of its final episode. “It’s time to play the music”: In 2012, “Tomorrow” is a musical-theater cliché, an easy shorthand deployed to showcase the unfailing optimism of all shades of Broadway strivers. The song hadn’t had the time to pick up that connotation when Petula Clark took it on in December of 1977—its source, the musical Annie, was only eight months into its six-year run on The Great White Way, and it’s possible that many viewers heard the anthem for the first time thanks to The Muppet Show. (The episode aired in the United States nearly a year after Annie took home the Tony for Best Musical, but still… ) Today, it’s difficult to listen to Clark’s version through the song’s layers of overuse/abuse, but for television audiences mired in a particularly grim stretch of the 1970s, it must’ve been nice to hear Clark making further promises about a place and time where the lights are much brighter. “It’s time to raise the curtain”: Jerry Nelson’s narration for Veterinarian’s Hospital does more than set up the sketch’s final punchline in Episode 220: It also gives the performers the time to reset themselves after shoving their characters into the sinkhole that opens up in Dr. Bob’s operating room. While Nelson reads his line, his co-stars reassemble beneath the operating table, an off-camera shuffling worthy of a live variety show. “It’s time to meet The Muppets”: The 12-foot-tall Bossmen were created for Nancy Sinatra’s Las Vegas stage show, and I get the feeling they’re a much more impressive spectacle in a live setting. But the characters don’t lose all of their wonder in their translation from stage to screen, and their breezy movements are well-suited for an airy cut like “The Girl From Ipanema.” And in light of the chroma-key mess of “Sea Shanty,” it’s nice to watch the Muppeteers pull off a visually complicated routine with the assistance of nothing but black fabric. “It all ends in one of two ways”: A modified Merdlidop brings At The Dance to a close by blowing her nose.